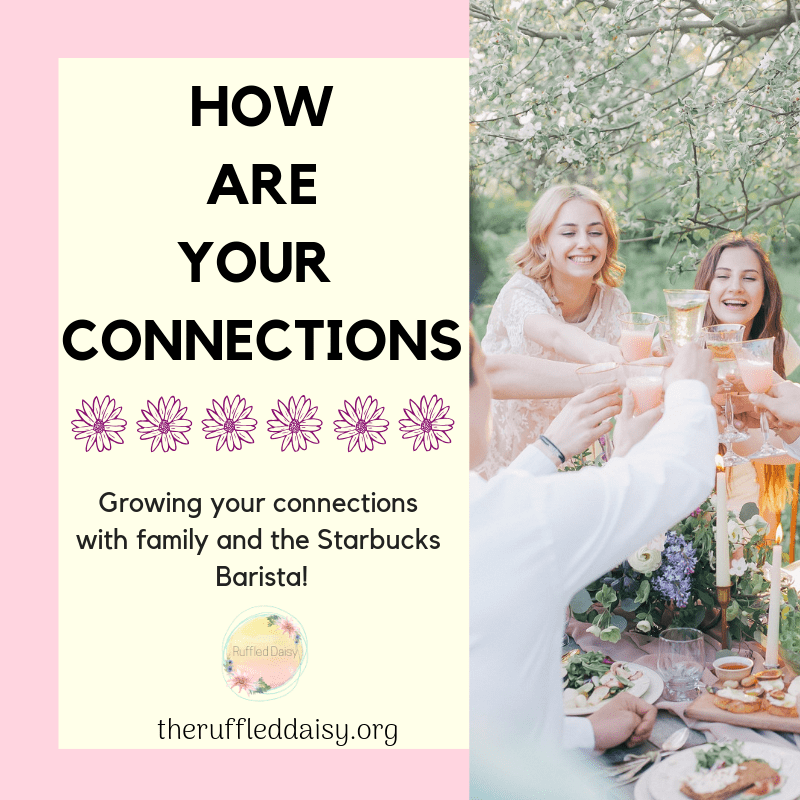 How are you connecting with those around you? Next stop, Starbucks where I order whatever I want to apply to my hips that day! While waiting for the steaming cup of “Joe” in my car at the drive through, I will check emails, FB, Instagram, or Pinterest. I pull through, receive my 500 degree coffee that I can’t possibly touch to my lips to for twenty minutes, pay with a smile and say thank you as I’m on my way. The next few stops usually consist of Target, Home Depot, Lowe’s, Wal-mart, Price Chopper or a million other places. All of them the same….going through the motions of what “I” need to get done. Ignoring the hundreds of people that pass by me on their way of accomplishing what they need to get done. I think it’s safe to say (at least for me) that at the end of the day, I have not truly connected with any one “soul”. Human interaction in being replaced at an alarming rate in today’s society and unfortunately it’s to the detriment of human connections. Bank tellers are replaced with ATM’s, operators are now replaced by SIRI, full service gas stations are now replaced by credit activated pumps, fast food chains have replaced home cooked meals, emails have replaced snail mail, and texting has replaced real phone calls. It’s no wonder that we are the most in debt, overweight, selfish society that we all like to complain about. I won’t lie…being the hermit that I tend to be, I enjoy the fact that all of the above saves me time and money. I HATE talking on the phone and will always prefer texting and going to the ATM is much faster than having to deal with a line at the bank. On the other hand, I used to love going to a gas station and have a little old man clean my windows and check my oil, all while pumping my gas. There is just something about that service that makes you feel good. And who doesn’t like getting snail mail…..and I’m not talking about the bills you get everyday. I mean a genuine, heartfelt card or letter. Connection with the outside world is what gives purpose and meaning in our lives!! Connection is what is missing in many of our lives! Even connection within the family circle is hard. We have to deal with preparing meals, cleaning dishes, taking care of pets, making sure your kids are where they need to be, making sure snotty noses are wiped, making sure your oldest, who doesn’t care about hygiene, has his teeth brushed before he heads out the door, making sure appts are made for dentists and doctors, blah, blah, blah…………. Add running a business our of your home to that mix and it’s a tsunami most days! Unfortunately, human connection is work!! It doesn’t just come! Most of us struggle immensely with it. I know that I am not alone; although at the end of the day when I am beating myself up on all that I “didn’t do”, it sure does feel like I am. 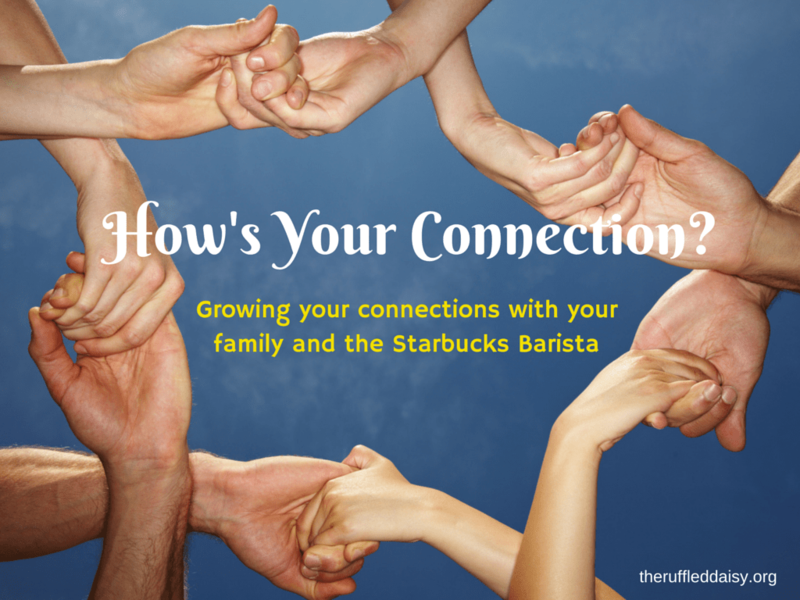 So what are some ways to make better connections with those you love as well as with the Barista that serves you coffee? 1. First and foremost – make good use of technology! Phones are great for paying bills, checking emails, and learning. BUT, make sure it isn’t taking away from the quality time you have with those around you. When you’re checking out at Target, put your phone down and focus on the checker. Ask her how her day is? Tell her that her earrings are beautiful! Make it a point to notice one thing about him/her that you can compliment. Just think about the confidence boost you would have given that person. That may be just what they needed at that very moment. When you’re at home, make it a point to only use your phone when there is a great need. Evenings in my house fly by fast and before I know it, it’s bedtime and we haven’t “really” spent time together. Sure, kids can use electronic devices when they are done with homework and you are preparing dinner but when dinner is over, make it a point to put all electronics to rest. In my house, we have started “family reading”. Every night (when dad is home) we all sit while I read them a chapter or two out of a novel that we have picked as a family. It’s the perfect way to wind the kids down for the evening and have meaningful conversations. 3. Renew your faith! This is something that I continue to work on daily, but I can tell you that without a doubt, the more that I involve GOD in my family, the better things go. Pray and ask God to show you where he wants you to grow. Pray over the friendships that you want healed and the friendships that are yet to be found. Pray about how you can be the most loving spouse even on the days where there doesn’t seem to be any more love to give. Find a church family that feels like home to you. Start a book as a family. Send a friend a simple “thinking of you” card. Pray about where God can lead you in your personal connections. I share all of these things to encourage you. These are things that I struggle with and am working on within myself to improve upon. 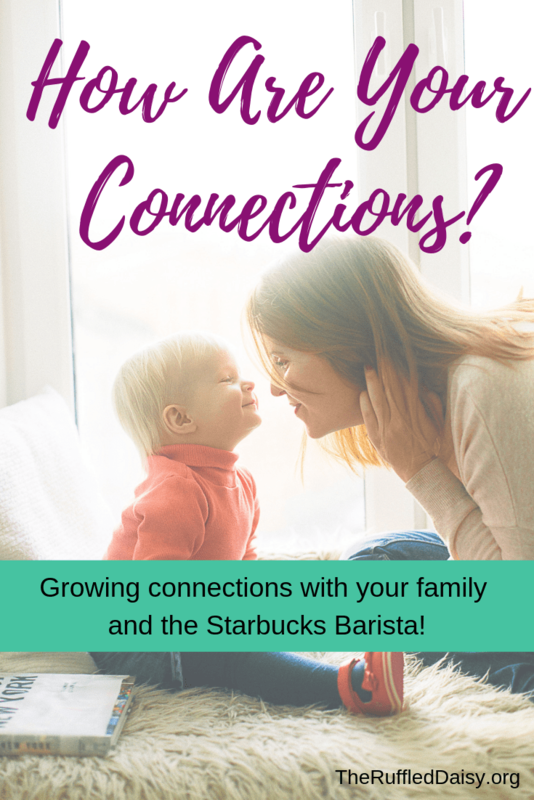 Do you struggle with human connectedness? What are you doing in your personal life to improve upon that? What have you done in the past that has made a difference in your personal connections with family and friends? I Didn't Marry "The One"